In the book, “Veronica's Grave: A Daughter's Memoir” by Barbara Bracht Donsky, the reader is asked to consider the expectations parents owe their children and the distance a child should go to in order to do right by family. Donsky experienced an upbringing where her mother’s existence is erased from her memories and she feels she has to hide the truth from her younger sibling. As we travel through the memoir, Donsky shares her adventures in school, her career in the air, and the expectations her parents constantly placed on her as the only female of two brothers. In a time when it was frowned upon, Donsky’s determination to attend college and forge her independence is admirable. The book is interesting. I liked being transported to an earlier period in time. Since the book is a time capsule of memories, it was eye-opening to read about the sexism that occurred and its acceptance. I admired Donsky’s determination to be independent despite her parents’ objections. I also liked the thought process of Donsky as a young girl. I found her innocence and naivety endearing. Donsky wrote analogies and metaphors very well, such as comparison of the family dynamic as a triangle or describing the wind like a sweater. The emotional resonance from not knowing what happened to her mother did not translate in the book. The emotions go from naivety about it as a young girl to thinking about her mother every now and then as she grows older. A deeper expression of the emotional turmoil when the feelings arose would have carried out a deeper impact on the subject matter. Although it is understood that the events transpired decades ago and it is difficult to remember all the details, the memoir mentions people and events quickly. There is frequently no build-up or explanation to the rest of a meeting and what transpired after. For example, Donsky writes about a date, and then the memoir skips ahead, where the reader finds out she has been writing letters to and receiving from the man for a period. Another example, she is in a relationship after the initial meeting with a man. It is possible that type of ambiguous writing style was intentional in order to keep the book within a certain number of pages; however, I desired more details on these events. I did enjoy the story, however, a couple of recommendations in order for the book to have been more engaging would be to portray the difference between what the characters were thinking, doing, or saying as the dialog was conversational all the way through. This particular style affected the overall engagement in the book. However, this may have been a stylistic choice since Donsky did explain she didn’t remember everything as vividly while writing the book. Another recommendation would be to include captions with the pictures in order to bring further context to the story. 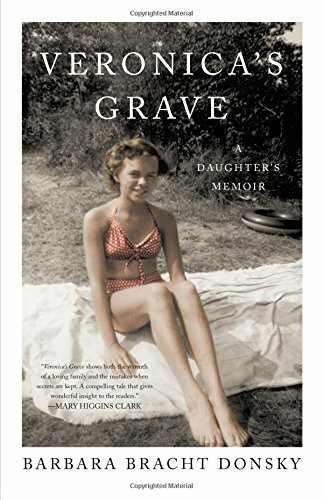 In conclusion, “Veronica’s Grave” by Barbara Bracht Donsky was a bittersweet and enjoyable story. Donsky experienced a tragic loss in her life that was not addressed until a much later time. Throughout the memoir, Donsky consistently challenged societal norms against women in a graceful manner in addition to challenging her family’s viewpoints. Despite the lack of emotional intensity and the ambiguity in certain events, this book is a recommended read.